You didn’t have anything you wanted to do today, right? Good. It’s time for an even more detailed look at Charon, Pluto’s outrageously enormous moon with bizarrely complicated geology. Charon is Pluto’s largest moon, and the largest moon with respect to its parent planet in the entire solar system. At just over 10% the mass of Pluto, the moon pulls the dwarf planet around their mutual center of mass (the barycenter), making a solid argument that Charon is actually the smaller half of the only known binary dwarf planetary system. These images aren’t the Charon you’d see with your own eyes: the extended-colour image uses blue, red, and infrared light to emphasize surface properties. The only real colour diversity is the red north polar region, an ice cap. More interesting is the wide range of landforms: rolling plains, heavily cratered lowlands, and, dramatic canyons cutting a belt across the monstrous moon. All the names of locations on Charon are still preliminary, unofficial names that makes the features easier to discuss even though they’ve not to be formalized by the International Astronomical Union. The northern ice cap is Mordor Macula, home to probable hydrocarbons, tholins formed by frying methane and nitrogen with ultraviolet radiation. It’s still being determined if the tholins could be captured from the sublimating ice escaping from Pluto, or if they’re somehow emerging from the interior of the moon. Oddly, hints of that same red show up around the equator. What’s the name of this world-tearing feature? Informally: Serenity Vallis. Even if the name doesn’t stick, we’re going to have a blast contemplating the epic geological battle that tore the moon asunder in Serenity Chasm. 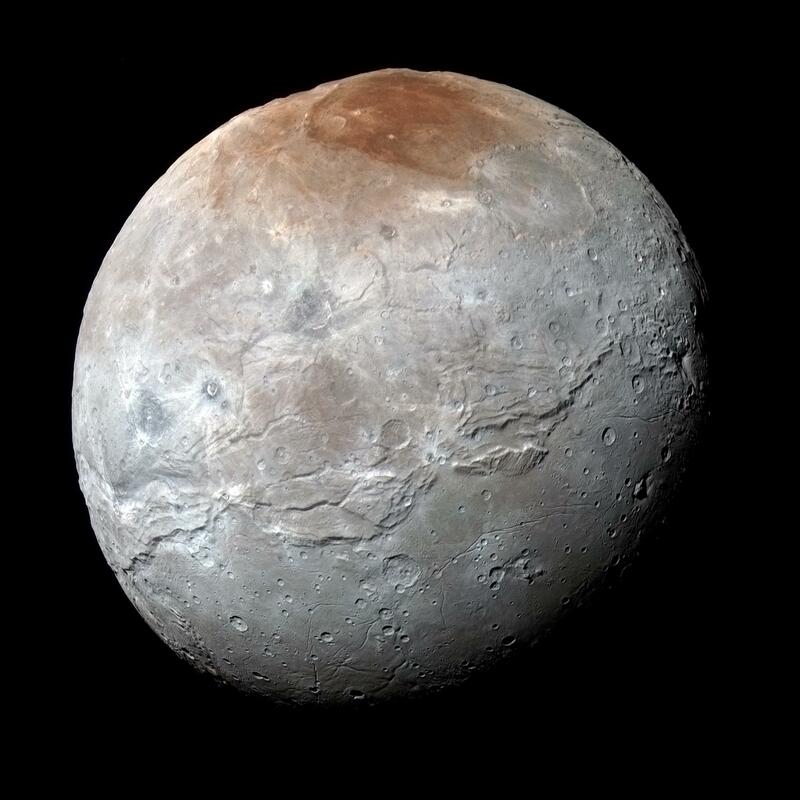 The first official flyover of Charon starts with Mordor Macula, the dark polar region, moving south to the massive chasm system. It descends from an altitude of 1,800 kilometers (1,100 miles) to just 60 kilometers (40 miles) to dart through the canyons before turning south to eyeball the odd moated mountain, Kubrick Mons . The best bit of all this mystery? The best is yet to come! The New Horizons spacecraft is still downlinking data, and will be until the autumn of 2016. Higher resolution images of Charon’s surface are still onboard the probe as it heads further into deep space, so we’re going to be seeing the moon in even greater detail in the months ahead.